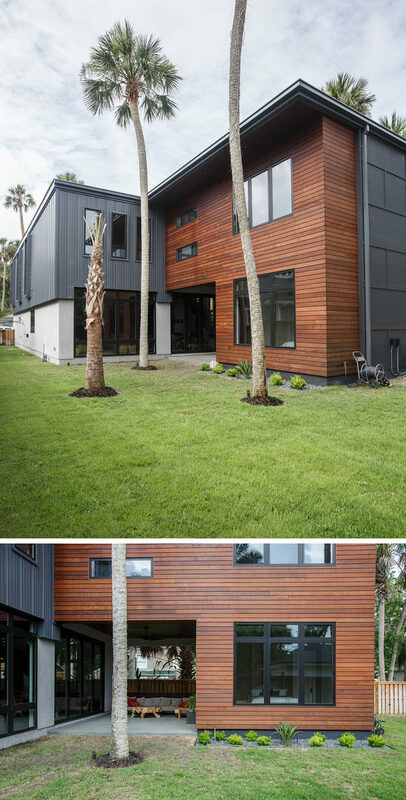 dig Architecture have designed and built this new home in Atlantic Beach, Florida, that features a contemporary interior with industrial elements. The wood front door of the house is tucked away down a path of pavers that’s surrounded by pebbles and grass. 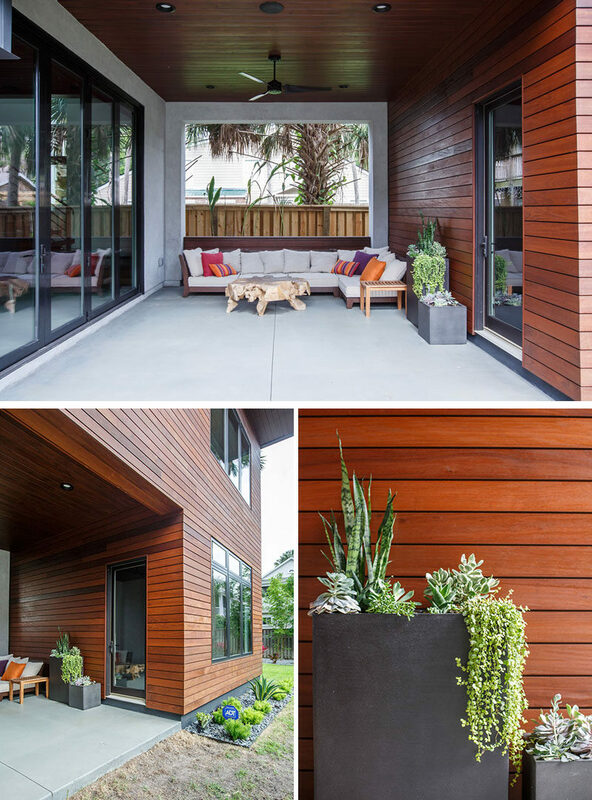 Inside the front door, the entryway features a wood bench and the grey siding from the exterior of the house continues through and becomes an accent wall. The entryway hallway opens up to the main living, dining and kitchen area. 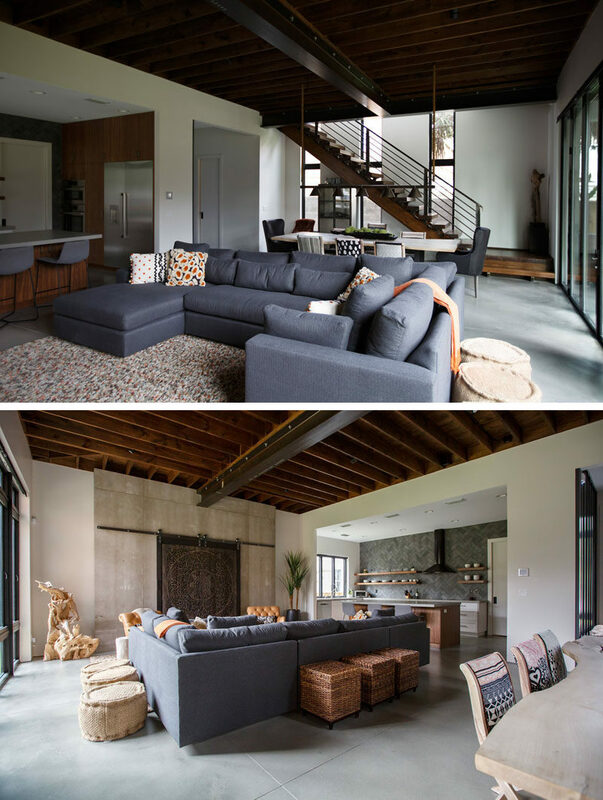 Exposed wood and steel beams draw the eye upwards to make the room feel large and spacious. In the living room, artistic carved wood panels on a simple metal track hide the television from view when it’s not in use. Next to the living room is the kitchen. Grey tiles in a herringbone pattern cover the wall, while floating wood shelves compliment the wood kitchen island. 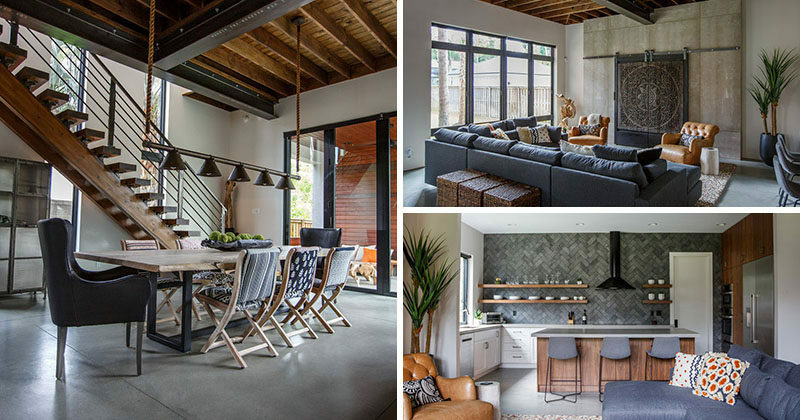 The dining room, which is behind the living room, features a wood table with a steel base, and above the table, industrial inspired lighting hangs from rope attached to the ceiling. Off the dining room are glass doors that open to a covered outdoor lounge area. The outdoor lounge opens up to the backyard with simple landscaping. On the right hand side of the outdoor lounge is a door that provides access to a bedroom. A wall of concrete-like panels becomes an accent wall and the black fan compliments the black door frame. The bedroom has an en-suite bathroom with a simple wood vanity and hanging round mirror. Back into the main house and next to the dining area are the stairs that lead up to the second floor of the home. 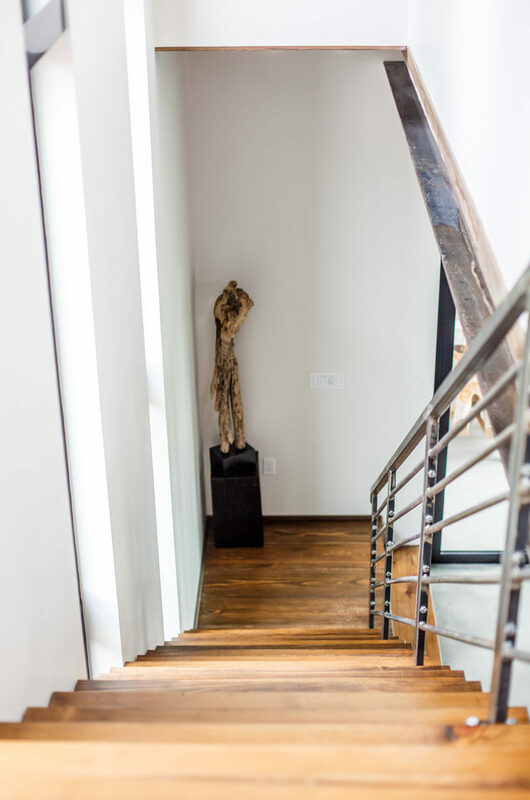 Wood stairs have been combined with metal accents and handrails to bring an industrial touch to the interior. 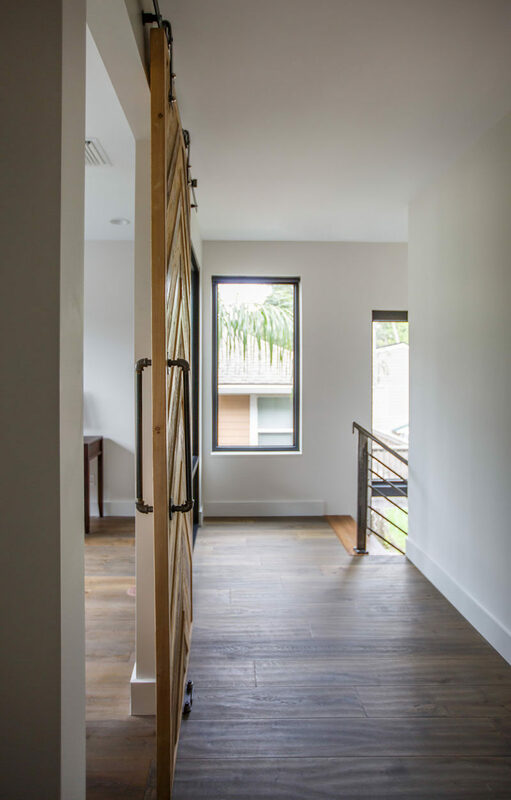 The stair treads are a warm, rich wood that’s highlighted by the use of simple white walls. At the top of the stairs there’s a hallway leading to a study / home office. A sliding barn door made from recycled wood provides access to the home office, while natural light from the window flows through a glass wall, allowing the room to feel open to the rest of the house. Down the hallway is a another bedroom. 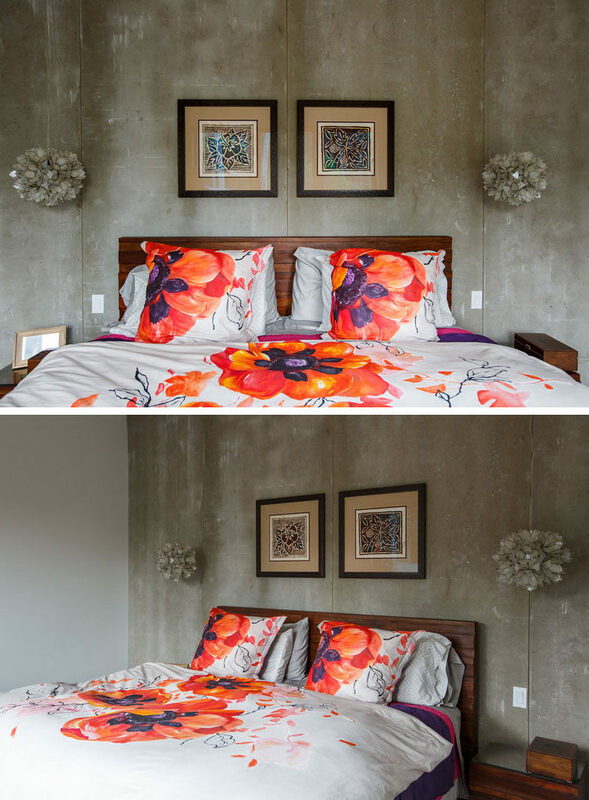 The same panels in the other bedroom have also been used as an accent wall in this bedroom, however a pop of color has been added with the bedding. There’s also a sitting area with a wood accent wall that’s decorated with faux-animal heads and artwork. In the bathroom, there’s a wall-to-wall vanity with plenty of counter space and storage. 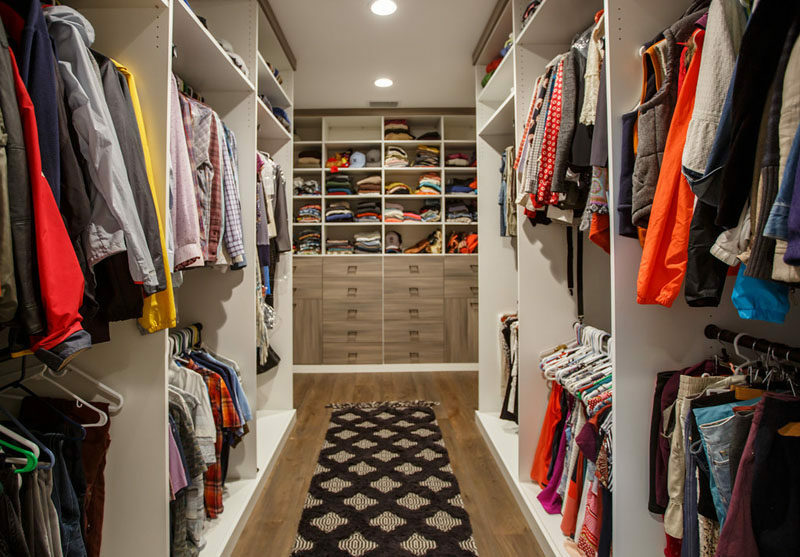 There’s also a large walk-in closet with floor-to-ceiling storage.